Disclosure: I was sent a copy of this DVD set from the vendor in order to write up an honest review. The views shared are mine and mine alone. "Celebrate more than 25 years of sharing, caring and imagination with Barney® in Barney®: Most Huggable Moments arriving on 2-disc DVD set, Digital Download and Video on Demand September 17 from Lionsgate Home Entertainment and HIT Entertainment. This very special 2-disc DVD set includes episodes never-before-seen on DVD and the delightful Barney®: Dino-mite Birthday. This stu-u-pendous collection of stories, songs and 5 bonus karaoke music videos is available for the TREMENDOUS value of only $14.98. 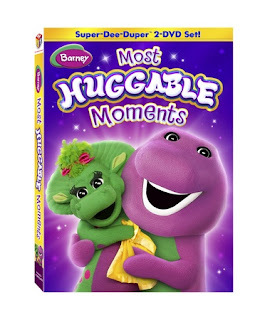 In this Super-Dee-Duper collection of the most huggable moments, Barney brings preschoolers on journeys big and small and reminds everyone that they’re special just the way they are! Barney shows Ryan that he doesn’t need to pretend to be someone else to be popular, and teaches Myra that her name isn’t the only thing that makes her unique. He helps Baby Bop discover meaningful ways to be a good friend, and BJ and Riff give new meaning to the word teamwork. Come along for the most huggable, lovable and memorable moments with Barney and his friends as they share, learn and grow together!" While, I, too, like to limit my Barney intake, I can see why the girls like this purple dinosaur so much, and why he has been around for years. Not only are the songs catchy, but the lessons shared with each episode are great ones for little ones to learn. In this new 2-DVD set, there are 7 full-length episodes (including the special "Barney's Dino-Mite Birthday), as well as tons of bonus features. Each of the episodes deal with teamwork, showing the importance of friendship and love, and even reminds children that they are all unique and special. market, and in the car. You just can't help it! :-) They are "Super-Dee-Duper!" One lucky reader will win a copy of this new Barney 2-DVD set, thanks to the folks at HIT Entertainment and Lionsgate Home Entertainment. To enter, please complete the entries on the Rafflecopter form below. Good luck! My son "graduating" from kindergarden last year! My 1st grandchild being born a few months ago, I love being a Grandma.